Income investors need to understand the differences between qualified dividends and ordinary dividends to avoid unnecessary tax consequences. While not the most exciting of subjects, understanding what you can do to maximize the amount of your dividends classified as qualified instead of ordinary can potentially save you thousands on your tax bill – and it only takes a few minutes to learn. Each year, we receive a 1099-DIV form in the mail. Banks, brokers, and others are required to issue this form to taxpayers and the IRS to report the total dividends and other distributions that we earned during the year. You can see the information reported on Form 1099-DIV below, and we will focus on the first two items (1a Total Ordinary Dividends and 1b Qualified Dividends) for the purposes of this article. Whenever you earn dividend income from your investments, it will be classified as qualified or ordinary for tax purposes. As you will see, this distinction has major tax consequences. 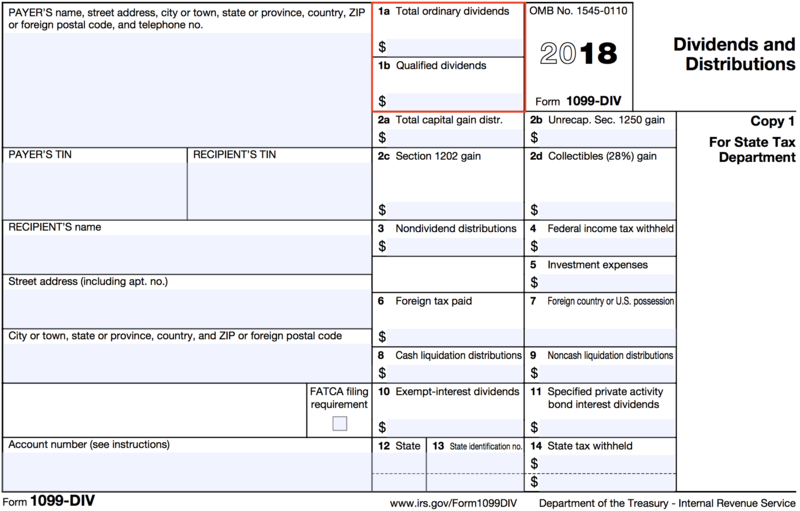 The first line on a 1099-DIV form shows the amount of ordinary dividends earned by you, the taxpayer. Ordinary dividends are the most common type of distribution made by corporations and mutual funds. Ordinary dividends are paid out of regular earnings and profits and are classified to you as ordinary income, not capital gains. As such, ordinary dividends are set to be taxed just like the income you would earn from your job. The IRS states that you can safely assume that any dividend payment you receive on shares of common or preferred stock is an ordinary dividend unless the dividend payer informs you otherwise. Qualified dividends can be found on line 1b of your 1099-DIV form. Qualified dividends are ordinary dividends that are subject to the tax rates applied to long-term capital gains rather than ordinary income. Long-term capital gains are taxed at much more favorable rates than ordinary income. As seen in the table below, qualified dividends are taxed at much lower rates than ordinary dividends, which can be taxed as high as 37%. For example, a taxpayer in the 32% tax bracket who receives $10,000 of ordinary dividend income would be on the hook for $3,200 of taxes. However, he or she would only owe $1,500 if the dividend income was classified as qualified dividends. These tax savings can be reinvested to generate even more dividend income the next year. It’s worth mentioning that investors with modified adjusted gross income exceeding $200,000 ($250,000 for those married filing jointly) will be subject to an additional 3.8% Net Investment Income Tax, which would increase their qualified dividend tax rates from 15% to 18.8% and from 20% to 23.8%. Still, there are major tax advantages to be realized compared to ordinary dividends. The potential for major tax savings begs the question, how can I make sure the dividends I receive will be treated as qualified dividends instead of ordinary dividends? What Qualifies as a Qualified Dividend? Any stock or an American depositary receipt (ADR) in respect of that stock meets this requirement if it is listed on a national securities exchange that is registered under Section 6 of the Securities Exchange Act. You can see a full list of these exchanges here, and they include all of the big ones such as the NYSE and NASDAQ. The other two conditions that can result in a qualified foreign corporation are if the corporation is incorporated in a U.S. possession or if the corporation is covered under under an income tax treaty with the U.S. (see Table 8-1 here). For stocks, you are also required to hold your shares for at least 61 days during the 121-day period that begins 60 days prior to the company’s ex-dividend date. For example, suppose you were interested in buying shares of Coca-Cola to receive its next dividend payment. If Coke’s ex-dividend date was May 1st, you would need to have held the company’s shares for at least 61 days between March 1st (60 days prior to the ex-dividend date) and June 30th to make sure the income is classified as a qualified dividend. The same holding period applies for shares of mutual funds that you own. Shares held of certain preferred stock are treated a bit differently. The IRS requires you to hold these shares for at least 91 days out of the 181-day period that starts 90 days prior to the company’s ex-dividend date. In either case, the IRS will reduce your holding period if your risk of loss is diminished. This occurs when you have hedged your equity position with options or the short sale of a substantially identical security. You are not allowed to count any days where your “risk of loss” is diminished as part of your holding period. Unfortunately, not all dividends that show up in box 1b of your Form 1099-DIV are guaranteed to be treated as qualified dividends. One of the easiest things you can do to maximize your share of income classified as qualified dividends is to continue embracing the mindset of a long-term investor. When we purchase shares of high quality dividend stocks, we intend on holding them forever, barring a material change in our opinion of the company’s long-term earnings potential or dividend safety. Quickly moving in and out of stocks results in significant trading fees and tax consequences at best and emotional trauma at worst. Qualified dividends are an extremely tax-efficient source of income, especially for retired investors depending on dividends to fund their lifestyle.